larry borsato | Unpredictable. Unfocused. Just like life. Worse for Keurig, as executives acknowledged Wednesday during its quarterly earnings briefing, sales of Keurig machines tanked and they began to accumulate on the shelves across the country. Sales of brewers and accessories declined by 23 percent, the company reported. Its stock price fell 10 percent in after hours trading. My kids have original Keurig machines, which they find convenient for making single cups for them to take to work. But in general the machines are about as environmentally unfriendly as they could be, and I’m amazed how quickly that style of single-serve machine took hold in a world that claims to be so eco-conscious. That aside, it is interesting to see such a rapid, obvious, and admittedly successful customer pushback. I also hope that this makes some companies think twice before trying to use patents or DMCA legislation to attempt to create a proprietary product where one should not be. Customers aren’t born. They’re created. What business, and “trickle down” economists, have not yet realized is that business does not create jobs. If you have ever owned a business you know that you don’t go out and hire people just because you have money in the bank. You hire people because you have work that needs to be done and the money to pay people to do it. You have work that needs to be done because you have customers. Nope. Nobody is born wanting to be a customer. They don’t say one day “I’m going to go out to buy that thing I’ve never heard of before”. People only become customers when they attempt to satisfy a need that they have. That need may be a physical one. Customers need to eat, so they buy food from grocery stores. It may be a psychological one. Women want to be seen as well accessorized, so they choose Prada handbags over a more utilitarian bag from Target. When you, the customer, realize that you have a need, and a product appears that fills that need, you will give the company your money in exchange for the product. As more customers satisfy their need with the product, the company will generally hire as many people as they require to create enough of the product to fulfill the needs of all of the customers. The customer create anything here. The company created or recognized a need, created a product to fulfill the need, made potential customers aware of their need and the product they could satisfy it with, and then sold the product to willing customers. The company created the customers. In the case of a product like the iPad, Apple created new customers out of thin air, because the day before the product existed there was essentially nobody with a need for the product. Apple created an entire market where none had existed before that. A hundred years earlier, Henry Ford similarly created a market for the mass produced automobile. Again, at no point did the customer create anything. Customers aren’t born. They are created – by companies whose products fulfill a need that they have. Successfully fulfilling a need for a customer is what creates jobs. The updated Billboard 200 will utilize accepted industry benchmarks for digital and streaming data, equating 10 digital track sales from an album to one equivalent album sale, and 1,500 song streams from an album to one equivalent album sale. All of the major on-demand audio subscription services are considered, including Spotify, Beats Music, Google Play and Xbox Music. It’s always easy to blame the big, bad internet for the problems of an artist, but let’s do some math first. Ms. Williamson’s 260,000 downloads would have been equivalent to at best, if all were digital track sales, about 26,000 album sales. Or at worst, if they were just streams, a whopping 173.3 album sales. Now a lot of detail is left out in the article. The song made it to number 3 on the Billboard dance chart. Was that purely on the strength of downloads? What was Ms. Williamson’s agreement with the record company? She is a co-songwriter, which means that she and her partner may share royalties equally with the artist. Or they may not. Or her contract may call for the marketing expenses of the record company to be fully paid before she sees a dime. After all, a record company would never treat artists unfairly, now would they? There are ambiguities here because of the way record contracts were traditionally structured and worded. Record deals with new artists are (nearly) always totally stacked in the label’s favour, to justify the investment the record company is making into unproven talent, and to allow for the fact that 90%+ of all the investments traditionally made by record companies fail to break even. Once a label has made back all and any monies it invested into launching a band, and releasing all and any of their records, it then agrees to share with the artist any future revenues that are generated by the sound recordings created under the contract. Though usually subject to a plethora of further deductions and charges, especially when recordings are monetised by another subsidiary of the label group the artist signed to. Some record contracts are more generous and less complicated than others. We could consider the legacy of problems artists have historically faced when dealing with music distributors. Or we could just blame the whole thing on downloading. Won’t somebody please think of the environment? Premier Kathleen Wynne is pledging to unveil a carbon-pricing plan this spring as Ontario looks to ramp up its fight against global warming. Premier Kathleen Wynne is leaving the door open to a new tax to combat climate change, just months after saying a carbon tax was not part of the Ontario government’s plan. After winning a majority government last June, Wynne said a carbon tax was not something the Liberals planned to introduce, even though she wanted a new plan to reduce greenhouse gas emissions. But that was months ago. Things change. It always strikes me as odd that every government plan to fight climate change doesn’t actually include a plan to, you know, fight climate change. But every plan does manage to take your money. The Ontario government is desperate for any source of money to pay the bills they refuse to cut. But I’m sure this carbon tax windfall will go directly to fighting climate change. If you’re interested, you can read more about why a carbon tax fails to satisfy any of its goals. Except, of course, for the revenue generation goal. Target says goodbye to Canada. NEW YORK (MarketWatch) — Target Corp. TGT, +2.89% said on Thursday it’s exiting its money-losing Canada business as it doesn’t see the region getting to profitability until at least 2021. The company, which opened its first Canadian store only in 2013, said it has 133 stores there, employing 17,600 people. The company expects to report about $5.4 billion of pre-tax losses for Target Canada in the fourth quarter to write down the investment. All I can think of is that they didn’t think through the who expansion very clearly, but I also know that this will leave a large whole in may shopping areas. Either way it is unfortunate. We value respectful and thoughtful discussion. But just to be safe, before you decide to comment we’ll just proactively stop you from doing so. For Christmas I got the Chamberlain MyQ Garage. It was a bit tedious to install, but I finally got it to open and close the garage door from my iPhone. 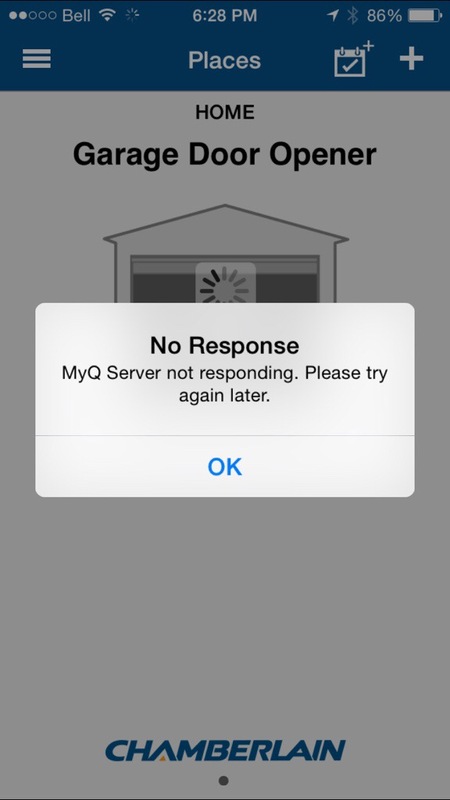 Yes, the error is showing up in the Chamberlain MyQ iOS app, but Chamberlain doesn’t seem to know what it means. I’ll give them a hint. Their servers are having issues. But I’m the customer. Shouldn’t they be telling me what the problem is? Chamberlain needs to work on their product because it doesn’t leave the customer with a good impression of the company. It’s been quiet here for a while. Hopefully that’s about to change. It’s easy to get trampled if you aren’t looking. A few short years ago everyone had a Nokia phone. I had a tiny little GSM phone that I bought when we lived in Boston and brought when we moved to Canada. Nokia owned the mobile phone space. Then they just seemed to stop. No radical new ideas. No answers to new phones from other manufacturers. One day companies seem to have it all, and be impervious to competition. That can change pretty quickly if you aren’t paying attention. Or if you are paying attention but fail to admit the possibility that you might not be right this time. Dark Patterns: Intentionally confusing the user. My biggest pet peeve in interface design is the popup that says “Are you sure that you want to leave this page?” when I navigate away from a web page. I see this as mostly being used by sketchy advertisers. I chose to navigate away from the page; it isn’t up to you to question me. Note to reputable web sites: Don’t ask this question. Just let me do what I have chosen to do. A dark pattern is a user interface carefully crafted to trick users into doing things they might not otherwise do, such as buying insurance with their purchase or signing up for recurring bills. Normally when you think of “bad design,” you think of the creator as being sloppy or lazy — but without ill intent. Dark patterns, on the other hand, are not mistakes. They’re carefully crafted with a solid understanding of human psychology, and they do not have the user’s interests in mind. The article provides several excellent examples, but I am always reminded of the olden days when I used Windows and products like Norton and other bloatware would ask questions at install time in such an obtuse way as to get you to install them when you really didn’t want to. If you are a reputable company with a good product, just ask the user a straightforward question. Otherwise it just seems like you’re trying to hide something.